John Ashbery: Was Plato right? Are the best poets crazy? You know it will happen: the inevitable revulsion: the coy poem that doesn’t mean anything, but washes over us with a million possible meanings, will, very soon, one day, make us sick, and post-modernism will become our vomitorium. Depends on whether somebody reminds you of me. Diamonds on stygian velvet, matters less than it should. Ambulances scoop up the quick and hie them to hospitals. What’s keeping us here? Why not leave at once? Laugh, drink, have fine time. It is a truism that art and life are mathematical: “She Loves You” is more interesting than “I Love You” because the former contains three souls and the latter contains two. Yet, as regards love lyrics, two might be a more popular number than three. Love, mostly, is a number. When poetry once had a certain amount of respect among the learned, back in the 19th century, it was sometimes referred to as numbers. Art and measurement were practically the same thing for two thousand years. Science has stuck to measurement, but art, over the last 150 years or so, has—and there can be no doubt—consciously rebelled. Now we are in la-la land. One could admire this (certainly it is more complex than “Everything depends on whether somebody reminds you of me”) but for us it is a let-down; it points to Ashbery’s laziness; the matter of “Everything depends on whether somebody reminds you of me” is allowed to spill. The poem is not building; it is dribbling what it had away. It is not that Ashbery makes the phrase, “Everything depends on whether somebody reminds you of me,” go away. It is still there in the poem. If the reader wants, they can pause and contemplate this delicious phrase. As we move into the next lines, the possible meanings of Ashbery’s poem explode into the nearly infinite—and surely Ashbery is proceeding along such an arc intentionally; he is stirring up the stream on purpose; he’d rather not mine “Everything depends on whether somebody reminds you of me” for its meaning; it is allowed to do what it can on its own, which is a lot, depending on how much the reader wants to contemplate it. But Ashbery has no intention of teasing out the meaning of this phrase for the reader. He is going to multiply his meanings with subsequent lines until there are literally billions of possibilities of meanings, just as one might simply string together random digits to produce a large enough pool of different social security numbers to fit a very large population. Adding does not produce meaning. Subtraction does. Ashbery is not interested in meaning, because his poems continually add item after item in a way that is essentially random. One could imagine a real person actually having this thought: “Everything depends on whether somebody reminds you of me.” It could mean a number of things, but it strongly evinces an emotional attachment between a “you” and a “me,” with “somebody” playing an interesting but subservient part. Perhaps the abstract meaning that leaps to the front of the line is: that in order for me to be memorable to you, I (paradoxically) must participate in the identity of others (“somebody.”)Ashbery’s next lines do not grow out of this phrase in any sort of logical or dramatic way; they are merely additions, which expand (loosen) the field, rather than narrowing (defining) it. Addition is a valid way to proceed, but it is a very particular way to proceed, and one which thwarts drama and meaning. The New Critics make much of the whole poem’s meaning as the crucial thing: whether or not a particular line has meaning is not as important as what all the layers and parts of the poem add up to. Ashbery, then, can use “Everything depends on whether somebody reminds you of me” as one part of his addition. Adding creates the potential for meaning, but never creates meaning itself. Ashbery does not mean. He adds. Is it the reader’s job to fit every part of the poem together? Or the poet’s? This question is not even fair to ask, because it is not a matter of reader versus poet. This gets us into a false argument, along the lines of the “Affective Fallacy,” another in the long line of New Critical red herrings. The real issue is “fit every part of the poem together.” If all we have in the poem is addition, it becomes mathematically impossible to “fit the parts of the poem together,” and this is precisely what Ashbery does: he adds without fitting. Ashbery, belonging to his Art for Art’s Sake school, is trying to escape the poem that means—the sort of poem that lacks art because all it essentially does is convey information which one could otherwise find in an encyclopedia. Ashbery’s escape is a noble pursuit of art, but we wonder if the escape needs to be pursued quite so desperately. Is Ashbery perhaps tunneling into bedlam? Casting an eye on just this one part, with the luxury that I will not make the effort to take it apart and demonstrate a talent I don’t possess, even my limited eye informs me that the critic was either unable or unwilling to exercise an imagination that would weave this fragment, not only into a whole cloth, but one in which each line was an essential thread. He simply stopped after the first line, conceded its possible compound meanings and then gave up on the rest. I don’t mind that, but I do mind discouraging others by dismissing as addition without accretion something which they didn’t even attempt to puzzle through the second line. It is indeed a fragment about numbers, the numbers of love in one obvious respect (about the rendering those numbers in any way that might respect our expectations about how numbers should behave in another). The critic likes the first line (we’ll count “everything as part of L1), but the second line is to the point and not so difficult — Ashbury does not like the easy shibboleth, pretty as it may be, and straight out says so — “That this is a fabulation, and that those “other times” negates it, and it is upon that platform that the rest of the fragment will engage the subject of the first line. Perhaps, that is what the critic most objects to, that his favorite line has been found inadequate? Sullied? the only hesitation in the 2nd line might be “other times”, what times are those? The one that comes to my mind most readily is that they are the times of absence for which the first line serves as predicate; the times in which things were asserted to depend on whether “you” were reminded of “me”. Those “other times” as differenced from times when perhaps ‘you are with me’, or perhaps when someone ‘does not remind you of me’ or perhaps, when you are alone? Obviously, I can’t stop at two lines, we’ll have to look at another (but even now, we haven’t approached la la land – “pure nonsense”? Hardly. Not even close.) With the third line, “Are in fact the silences of the soul, picked out in” we have the complete counter-thesis. Nothing strange or nonsensical about it. Those “times” (whichever/or all three if you like) of them are not the independent clause upon which everything else depends — they are not even informative. Rather, they are “silences of the soul”, quite a different order of cathexis into which the numbers of love might attach themselves and plunge. Is that what begins to give the critic difficulty – does “silence of the soul” violate his sense of rational numbers (say of the first lines which he might neatly, if oddly, add up as 1+1+ , say, 0.05 (for residue of “reminds you”) = 2)? Is that the grail of la la land into which the critic is unable to follow? But I’m into the 3rd line, and past my limit. What is clear is that the moment of concern is brought into intensely high-relief in those few lines. True, it seems to lack the loving fulfillment the critic appeared to require. True, the poem would seem to be going in a different direction than the first few words might have taken it, if left on their own. But I fail entirely to see how our why that faults the poem. Its not la la land. I have very clear impressions of what he’s saying, the images he’s using and recognitions of a number of rather common tropes. Moreover, I have as much interest in hearing the rest of the case as I would if someone said, “I doesn’t all depend on a red wheelbarrow…beside a white chicken”. What I’m saying is, the critic’s demands for the mathematics of poetry or love (whatever those may be) to depend on adding up in the fashion of “defining further” or “narrowing” is nonsense; and to swerve from that arithmetic is not the same as committing some random acts of piling things on top of one another. There are difficulties, to be sure. All of Ashbury presents difficulties. Don’t go there if you don’t want them. But to savage by holding a work to that standard would be like holding a mathematician to the set of positive whole numbers. . I guess what bites me most are critics who insist on following some little tire tread of an expectation (or litmus test for a poem) they can’t get off of, and thereby dissuade others from having a close look as if the ground has already been covered. I’m no expert, I admit that. But there’s enough sense well beyond the first line to make me want to discover what the rest might have in store. Its a very complicated subject, these numbers of love. And I sense something being woven here that at least embraces the puzzle of those numbers, even if it doesn’t resolve them. And my first reading tells me that it does so consistently throughout the fragment — each line essential, each enveloping the previous lines. That’s quite a feat, in and of itself. By the time we get to Aglavaine.and Sélysette we ought to be primed for dealing with real love numbers — does 3 add up to 1 trio? 2 duets? 3 games of solitaire? : or a sextet? Its a poem about absence, replacement, displacement, distraction and discretion – does that have to add up to a desperate escape into Art for Arts sake? I think not. There’s something quite beautiful going on here, and I think it a mistake to stop at the first line, because one can’t quite get the numbers to come out right in the next 17 or so? Even though I haven’t pulled the piece apart for you — my bet would be not to chuck it on the say so of someone who didn’t get past the first line. When you have satisfactorily analyzed the whole poem and you are 100 years old and everyone who remembers Ashbery is dead, you may then admit I was correct–but only then. Ashbery proves that nonsense is always smarter than we are. The mathematics of mere nonsense has formulas we could ponder for days, and if love is frivolous, still we wish love to last a long, long time. Ashbery has too many loves. I don’t want to be one of them. And it’s not that I don’t love Ashbery. It’s just that time is cruel. The critic never discourages poetry. Only the poetry can do that. I wonder how Eliot’s objective correlative would apply to Ashbery? If it wounded Hamlet, I wonder what it would do to Daffy Duck? Thomas, I think you need to hone your dictionary skills. I suggest yoou begin with the word ‘nonsense’. The critique asserted everything after the first line was “nonsense” I only needed to show a line or two after that made very good sense. I did that. What I do with my next 100 years, or 10 minutes is irrelevant. What Eliot said is irrelevant. And so is an autopsy of Daffy Duck. That there is a body of critique that has judged Ashbery. as “double-talk” is evident. But there has been equal and well defended body of critique (Perloff, Bernstein, Tranter, Schultz, et. al.) that has found such criticism to be shallow and inconsistent with the texts, particularly in their expectations that Ashbery’s debt to Eliot implies the same kind of analysis and reading that applies to Eliot is equally valid in application to Ashbery. It is not. Ashbery’s break with Eliot (as well as Stevens, Williams and others) is precisely one which would appear to be nonsense to someone who employed the same templates to understand him. And that is what flaws this critique more than anything. For one, the expectation that the meaning of a work can be unfolded from any single line or passage, which is one of the constraints which Ashbery ignores, as Perloff and other point out. And that critical flaw is exactly what your critique exercises in its analysis of the fragment failing simply because it deviates from your expectation of what it “ought” to have developed — that the fragment does not build on the point that you find so interesting, but which really has little to do with what the fragment is actually describing. 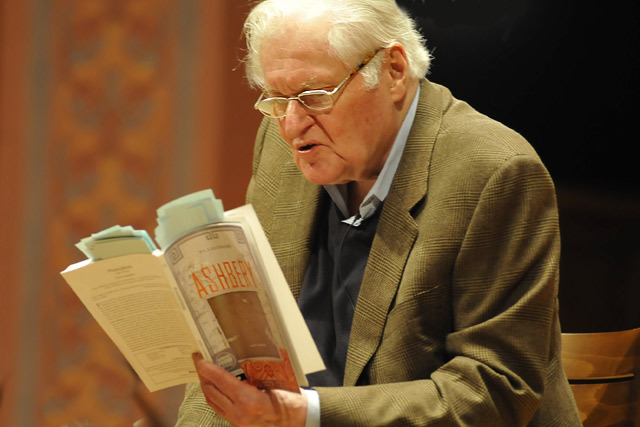 It is the expectation that Ashbery fails if he fails to track on the line from Eliot to post-modernism – which he does not; not by his texts, not by his own statements on what he is doing. A filter which insists on such fidelity to a lineage which Ashbery has broken away from is one that will find little but nonsense in his work — but that doesn’t at all mean that it is nonsense. And a critique which does so may not only miss entirely what is going on, it is an arrogance that does damage to the project itself. Poetry only discourages poetry when it is remarked by those who can actually read it for what it is, rather than for what they need it to be. Yes, time is cruel. And that leads me to wonder why you and others with similar opinions of Ashbery’s work spend time savaging what you clearly don’t like and evidently don’t understand? It was Kermode, I believe, who was asked why he didn’t engage in fault-finding or disapproving criticism. His reply was simply that he found no reason to spend the precious little time he had either reading or remarking on works he found flawed when there was so much really good material which was a joy to critique and an exercise in enrichment both for himself and his readers. You may say “Time is cruel,” but you certainly don’t act as if you believe that. Like I said, I’m no expert. I likewise enjoyed your comments. I do advise others intrigued by Ashbery to dig further than the criticism offered on this page suggests on should — just on the odd chance there may be much more of interest than the this critique could uncover. And it doesn’t take 100 years to know that. A few weeks of careful reading won’t make you an expert, but it should pay dividends to anyone who gives it their attention. It did for me. I think my point still holds: with every line, the possible meanings of Ashbery’s poem radically increases. There’s maybe a dozen possible meanings in line one; a thousand possible meanings in line one plus line two; a million possible meanings with line one, two, and three; a billion possible meanings with line one, two, three, and four, and so on. There’s a certain class of mind, groomed perhaps by the New Critics and their faith in the text, that says, ‘the poem means and says just what it means and says and no more.’ Now, I will not deny that this is almost possible, and perhaps 99% possible. But we should also acknowledge how easy it is to stray from this kind of certainty: There’s already a host of questions generated by “Everything depends on whether somebody reminds you of me.” Who, exactly is the “you” and the “me?” Why “everything?” “Remind,” in what way? But let’s just assume the fairly simple meaning I originally gave to it above. You certainly did an admirable job of explaining the next line, but surely you see the difficulty,if not the impossibility of proceeding. The center cannot hold. There’s a larger issue: once we say what a poem ‘should do,’ we put ourselves outside of what the poem is doing—any critical approach has this built-in dilemma. So maybe Ashbery doesn’t want limited meaning, maybe he wants to avoid ‘dramatic conflict,’ maybe he’s looking for a bland and unruffled view of reality, maybe he wants to be stoned, maybe he wants unlimited comtemplative possibilities, maybe this is what he (and his readers) want. Who am I to say this can’t happen? You of course are right: the word “nonsense” is not quite the right meaning—and perhaps we need a new term to describe this. When does a wealth of possible meaning become no meaning? What if Ashbery has a worthy agenda, and you have a worthy agenda in trying to understand Ashbery, but what if, in the final analysis, we are still faced with more nonsense than we can possibly digest? If we were gods, and we had world enough and time, the Ashbery excess would be a moment’s delight. But in the real world, is it even that? Do we have no rights as readers to understand? Or perhaps all this “matters less than it should.” And Ashbery has the last laugh. What’s wrong with “savaging what you clearly don’t like” ? I only meant poetically & esthetically.